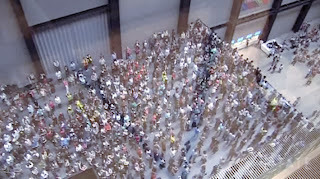 Tate Modern's vast Turbine Hall was filled with the noise of 1000 people screaming in unison as loud as they possibly could. I was one of the screamers on the bridge of the Turbine Hall, contracted for these few seconds by the Italian artist Paola Pivi. One thousand people make a lot of noise, and I was hoping to listen to the reverb we would create after letting out one single scream with one bout of breath. Alas, any reverb drowned in a prolonged screaming attack stemming from the visitors, who initially joined our scream, but were not instructed to stop as we were. What was conceptualised as a short few seconds display triggered a visitor reaction that was at least five times as long as our performance - and we only realised after a few moments what was happening.